At Heart of Wellness, Acupuncture & East Asian Medicine is a key and integral part of our mission to provide “Healing for the Whole You.” Our acupuncturists work directly with our naturopathic primary care physicians and our physical medicine providers in order to provide you with holistic, individualized treatment plans to help you achieve greater overall health and well-being. Acupuncture & East Asian Medicine is the oldest continuously practiced system of medicine in the world. It is comprehensive (meaning that it is effective in treating a wide range of conditions) and it is holistic (meaning that it is focused not only on healing injury and curing disease but also on supporting your optimal functioning as a whole being). Practitioners of East Asian Medicine prescribe combinations of herbs, nutritional supplements and other medicinals, suggest rehabilitative practices and exercises, provide systematic lifestyle recommendations, and offer traditional physical medicine treatments such as massage, cupping, gua sha (a traditional form of myofascial release) and of course acupuncture.Acupuncture is not only the most easily recognized aspect of East Asian Medicine, it is also the most widely practiced modality in Complementary and Alternative Medicine as a whole. Over the past 25 years, the most dramatic increase in acupuncture use has been in America, such that today the use of acupuncture in the United States is second only to its use in China. Acupuncture & East Asian Medicine have been proven (both through the long course of time and through modern controlled clinical trials) to be effective in treating a wide variety of conditions, including physical injuries, all sorts of pain patterns, common illnesses and complex disease. Modern science has recently recognized that we human beings are complex bio-electrical systems, generating and interacting with fields of energy as we go about our day. This understanding has been the foundation of Acupuncture & East Asian Medicine for thousands of years. According to East Asian Medicine, when you experience illness, it’s because there’s an imbalance in your life force, or Qi (“chee”). Qi circulates throughout the body and this circulation generates fields of resonance that can lead to health or disease. Acupuncture points are located at key locations along these channels of flow and within these intersecting fields of resonance. Acupuncture involves stimulating these points by applying slim needles to the surface of the body. Stimulating these points adjusts the circulation in the meridians and rebalances the intersecting fields of resonance, which has the effect encouraging the body to recover from injury, heal from disease and let go of chronic pain patterns. Many of the energy pathways identified in East Asian Medicine correspond with known neurological and electrical pathways that are organized throughout the human body. These pathways connect with muscles, connective tissues and internal organs and work with endocrine and circulatory systems in order to maintain dynamic homeostasis in the body. Scientists believe this is the foundation for how acupuncture works. Based on your primary concern, an acupuncturist will assess your lifestyle habits, energy level, emotional state and medical history. You’ll also be evaluated regarding body temperature, the condition of your tongue, and qualities of your pulse, all of which indicate where your Qi/energy may be blocked. 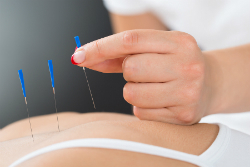 Your practitioner will then describe a course of treatment, including the use of extremely thin needles, which can be placed anywhere on the body to stimulate healing. Your practitioner may also recommend herbs, nutritional supplements, physical and/or spiritual exercises, and dietary or lifestyle changes. While many people feel nothing during treatment, some experience a dull ache or tingling around certain needles. This is an indication that “healthy flow of qi” is being restored. Generally, there is no long lasting sensation during or after an acupuncture treatment and many people fall asleep. The overall experience is very relaxing and rejuvenating. Researchers have determined that acupuncture treatments are one of the easiest ways to experience the brain wave pattern associated with the hypnogogic state – a state between waking and sleeping that is generally very healing. In Washington State specialized training and certification is required to practice acupuncture and East Asian Medicine. This includes 3-4 years of study, hundreds of hours clinical training, and an examination for licensure. At Heart of Wellness we have three excellent acupuncturists ready to help you. This entry was posted in Articles and tagged acupuncture, healing, healthy lifestyle, Heart of Wellness, Natural Treatment, traditional chinese medicine. Heart of Wellness is on the Top 75 Naturopath Blogs!